Can you believe it's August and kids are going back to school already, where did the summer go? 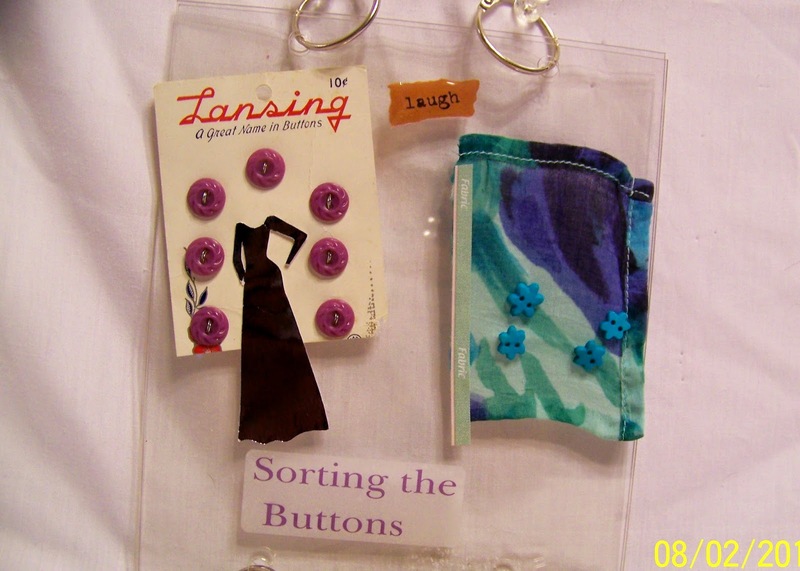 Today at Just-A-Scrappin' Aug 7, 2014 Challenge is using a favorite template - anything goes adding a few buttons. Make a cards, layouts, 3D projects or altered art. All embellishments, paper and card stock is from my stash so I do not have all the names of the companies. 1. I'm using 7gypsies Hanging Book album in clear acrylic for myself. I cut a dress from purple metallic paper with Cricut Forever Young cartridge at 3 1/4 inches <Model10-s>. 2. Adhered with Tombow permanent adhesive onto the button card.Then the card of buttons and dress to the acrylic page. 3. Add the fabric with Tombow to the acrylic page then placed the fabric trim from Mrs. Grossman's Design lines. Used Zot's glue dots minis to add the blue buttons to the fabric. 4. Computer printed on Office Max clear address label the "sorting buttons" that always goes with my sewing. 5. Last I placed the "laugh" at the top because all the buttons do not match just like in real life.